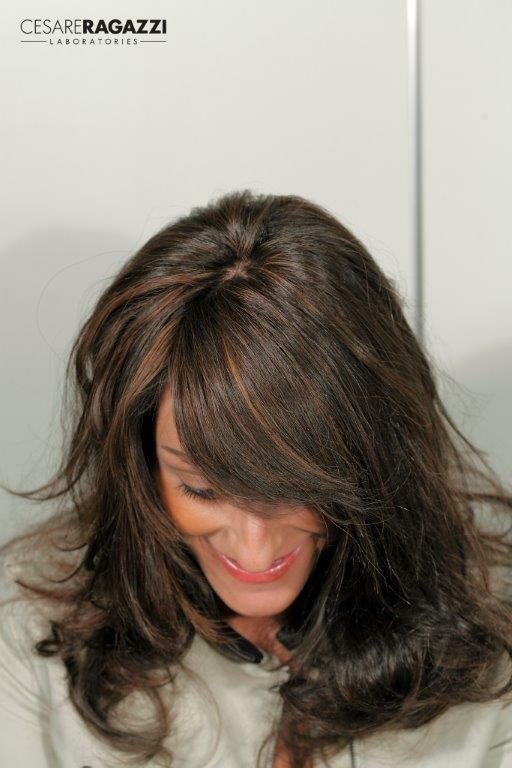 Tu Bella is an exclusive provider of Cesare Ragazzi’s CNC hair systems in the Chicagoland area. If you’re looking for the best hair solution options and want to walk with confidence, then look no further… Cesare Ragazzi is for you. This hair system is completely custom for women, men and children, and can be a full or partial system. Cesare Ragazzi has taken hair replacement to a whole new level with comfort, confidence, and realism. Each custom system goes through 39 steps that are all completed by hand. Cesare Ragazzi Laboratories (CRL) offer unique and proven solutions to restoring hair and rebuilding confidence. Once treatment is completed, women and men can return to full styling treatments and high-impact sports. Enjoy the peace of mind that comes from using an established system that is sweat, stress and water-resistant, and stands up to sun exposure guaranteeing a practical and long-lasting solution. Rely on a hypo-allergenic system that has been dermatologically tested and maintains a normal scalp and skin ‘breathability’, as well as offering antibacterial protection for your skin. Design, Creation, and the Application. It begins with focusing on you, paying close attention to your needs and wants, to design every detail of your new system. After we determine your natural hairs density/texture/color/wave/ and growth pattern, your face shape, skin and eye color and your lifestyle, measurements/perimeters are taken to design two custom design molds. One mold is to duplicate your exact head shape/contours and the second mold is to get the exact area of coverage needed, trying to use as much of your natural hair as we can. Combining all this together, we then ship your design off to Bologna, Italy where the 39 steps start to create your system. At Cesare Ragazzi’s headquarters in Italy, the base of your unique and custom system starts with a 3D printing to precisely match your scalp. The base is made from a one-of-a-kind patented biomedical polymer, developed solely for hair restoration, by Cesare Ragazzi and their university research partners. The micro-thin base of this system is breathable, hypoallergenic, FDA approved and is perfectly matched to the color of your scalp, to create an undetectable look. After the base is ready, individual strands of virgin hair are anchored by hand into the hair system. The method they use protects the cuticle. A pattern is started to mimic your natural hair growth pattern. Quality control then tests to make sure the hair system will fit securely, and it will hold its style, to give us what we designed. The wait is over… after looking at your new system, you will realize it was worth wait! The new system can be applied without damaging your existing hair and preserving any new growth. Cutting and styling your new hair will complete the application process. Lastly we discuss at home hair care to keep your hair looking great every day. The best part… is forgetting about you hair loss. The Cesare Ragazzi CNC System, is a semi-permanent hair restoration solution, that is to be bonded to your scalp and stays in place 24 hours a day for a month. Sleeping, bathing, swimming and high-impact activities are not a problem anymore. Once a month maintenance is required to re-secure your system. You won’t believe how natural it looks and feels and you can stop thinking about your hair loss.